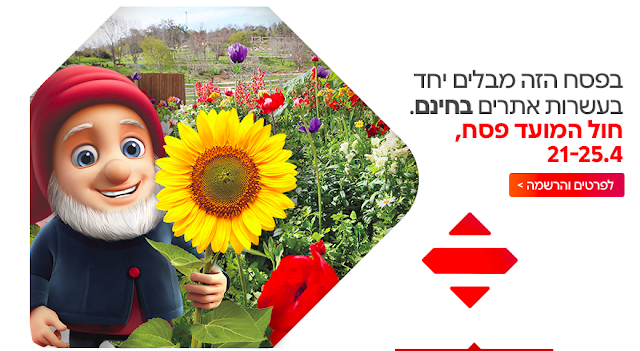 Most sites will offer free admission on Chol Hamoed from April 21-25. Always verify opening hours before you go! Here's the list of free attractions for Pesach 2019, sponsored by Bank HaPoalim. I have linked to websites in English, whenever possible. I hope you find this list helpful, and that you get to have some super-frugal fun over Pesach! You can call *2410 for information about the Bank HaPoalim sponsored attractions. If you haven't already, go ahead and like my Facebook page so you don't miss out on deals and great info all year round! p.s. Please share this with your friends, so everyone can plan a fun and frugal Pesach! p.p.s. If you're looking for discount admission to some of the not-free things to do, be sure to check out these deals! Help Yourself to Restaurant Savings (North & South)! Kosherfrugal.com and Janglo have teamed up to bring you some great GROO deals you don't want to miss! This post focuses exclusively on kosher restaurants and take-out food, so if you're going to splurge, you can now afford to splurge a little more, with discount vouchers and savings. Pre-purchase your vouchers and save up to 50%! This is a GREAT way to save when you want to splurge! Don't miss out on the savings - check below for savings in your area! I keep checking for new deals, as I know you've been waiting for some, and this week there are some changes, so check carefully! Also, be sure to check the Facebook group so you don't miss out! If you're looking for restaurant deals in the Merkaz & Jerusalem, click here (I'll add this link when I can)! If you're looking for discount admission tickets, not food, click here (I'll add this link when I can)! 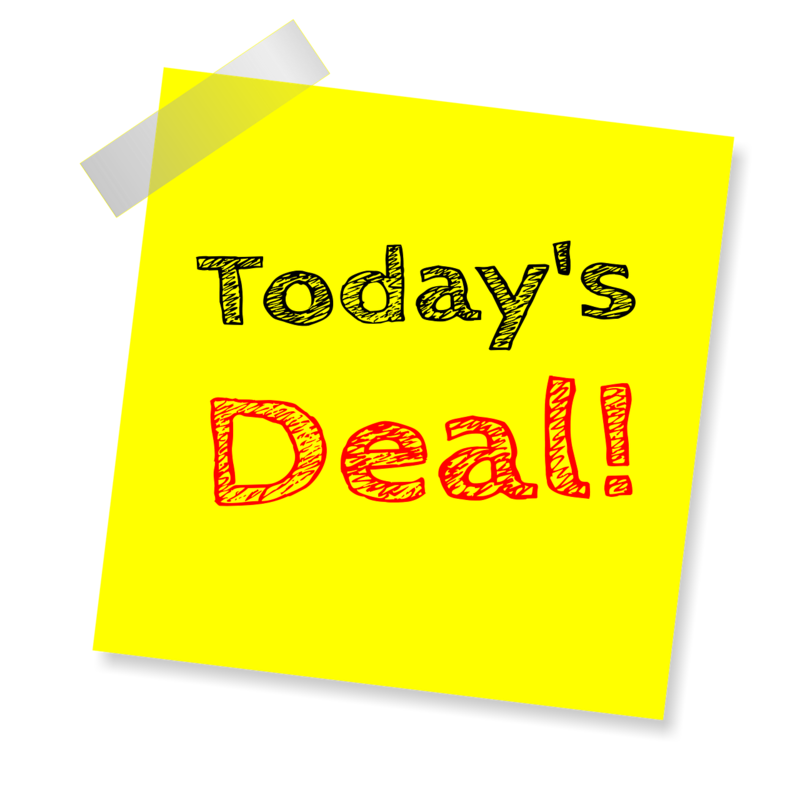 Olive Oil deal from Meshek Aloni - delivery is not included in the deal. 2 liters for 79 nis, or 4 liters plus a jar of olives for 144 nis. Or this new olive oil deal from Meshek Achiya - 5liters plus 250 mk bonus bottle, for 199 nis plus shipping! Handmade Chocolates from La Poem. Delivery available throughout the country. Various gift packages available for 40-52% off! Sinta Bar Express, Kiryat Ata - dinner for 2 for 189 NIS (your choice of entrecote steak or salmon), including the alcoholic drink of your choice, and much more. Voucher valid thru May 31, 2019. Redeem only at the Kiryat Ata location, Sun - Thurs, 11 am - 10 pm, Fridays 11 am - 2:30 pm, and Sat. nights, from 1 hour after Shabbat until 11 pm. Not valid on erev chag, holidays, chol hamoed, or during private events. Not valid on election day, Apr. 9, 2019. Reservations required. Limit one voucher per couple per visit. Every person at your table should have a voucher. Any member of your party without a voucher will be required to place a minimum 80 shekel order. Breakfast for 2 at HaBimah Cafe, Kiryat Ata, for 68 NIS. Voucher valid for 60 days from date of purchase. Redeem Sun - Thurs, 9:30 am -7 pm, Fridays 9:30 am - 3pm, and Sat. nights, from half an hour after Shabbat until midnight. Reservations required. Not valid during "events". Limit 1 voucher per couple. Max 2 couples with vouchers per table. Anyone at your table without a voucher will be required to order an entree from the menu. There's also a lunch/dinner for 2 deal - for 78 NIS or 108 NIS. Hamezach (Tiberias) - premium breakfast dea: 85 nis for 2)! Voucher valid for 60 days from date of purchase. Redeem Sun - Thurs, 10am - 5pm, and Fri, 10am - 3pm. Limit one voucher per couple. Hamezach (Tiberias) - lunch or dinner for 2, starting at 99 nis (upgraded and premium meals are also on Groo!). Voucher valid for 60 days from date of purchase. Redeem Sun - Thurs, 10am - 11pm, and Fri, 10am - 3pm. Limit one voucher per couple. Trumpeta Restaurant (Kiryat Bialik) - meal for 2, starting at 109 nis. Valid for 60 days from date of purchase. Redeem Sun - Thurs, 11 am - 11 pm, and Fridays from 11am - until 1 hr before Shabbat. Limit one voucher per person. Morgenfeld (Achziv) - S. American Grill meal for 2, starting at 199 nis. Voucher valid thru Apr. 30, 2019. Redeem Sun - Thurs, noon - 11 pm. Reservations required. Limit one voucher per person. Sinta Bar Kenyon Sha'ar HaTzafon (Kiryat Ata) - 50% off burger meal for 2! Voucher valid for 60 days from date of purchase. Not valid New Year's Eve or Valentine's Day. Redeem Sun - Thurs, 11 am - 10 pm, Friday 11 am - 2:30 pm, Sat. night 1 hr after Shabbat ends until 11 pm. Reservations required. Japan Japan, Yokneam - Sushi Deal is 49 nis, Stir-Fry Deal is 69 nis. Limit one voucher per person, and limited to 3 vouchers per party. Max 4 people at a table with vouchers. Not valid for delivery orders. They ask that you call ahead. Redeem your voucher Sun - Thurs, 7 pm - 11 pm, Friday 11 am - 3 pm, and Sat . nights till 11 pm. Voucher valid thru June 30, 2019. Shytel in Nahariya (Badatz/Machpud meats) - Dinner for 2 starting at 135nis. Max. 3 vouchers per table (3 couples). Good for 60 days from date of purchase. Reservations required (blackout dates may apply). El Rancho, Tiberias - Lunch for 2 (regular or premium meal - 149 or 169 shekels). Valid every day before 6pm. Reservations required. Voucher valid for 90 days from date of purchase. Iskander (Mehadrin) at Nahar Hayarden (upper Galilee) - dinner for 2 for 219nis. Valid for 60 days from date of purchase. Max. 3 vouchers for table (3 couples). Reservations required. Redeem Sun - Wed, noon - 8pm, Thurs. noon - 9:30pm, or Friday noon - half an hour before Shabbat. Breakfast Buffet at the Crown Plaza in Haifa - 59nis for 1/109nis for 2 (69/129 on Fridays). You must buy the deal that is valid on the day you want to go (Sun-Thurs OR Friday). Reservations required. Breakfast is served 6:30-10:30am. Voucher valid thru May 30, 2019. Shela Restaurant (Kiryat Motzkin), for 79nis per couple. Limit 2 vouchers per table. Voucher valid for 90 days from date of purchase, with advance reservations. Valid Sun-Wed, 10:30am - midnight, Thursdays, 10:30am - 5pm, Fridays, 8am - 2pm. Max 2 couples with vouchers per table. Two Felafels with French Fries at Olam HaOchel, (Haifa) or two omelet pitot with french fries) for just 19nis! Valid for 60 days from date of purchase. Can be redeemed Sun-Thurs till 9am - 5pm, Fridays 8am - 3pm. Or choose the chumus platter deal, starting at 12.50 nis (valid for 90 days from date of purchase). Olam Ha'Ochel in Haifa (meat restaurant, with tons of salads for the table) for just 39nis per person (77nis for 2!). Voucher valid for 60 days from date of purchase, and only from 9am - 5pm (Sun-Thurs) or 8am - 3pm Fridays. Dinner for 2 at Derby Bar Fish & Meat (Ashkelon Marina), for 199 NIS. Voucher valid thru June 1, 2019. Redeem Sun - Thurs, noon - midnight, Fridays noon - 4pm, and Sat. nights from 1 hour after Shabbat until midnight. Not valid on election day, holidays, or chol hamoed. Reservations required. Max. 3 vouchers per table. Anyone without a voucher must place a min 100 NIS order. Sushi from Togarashi, Eilat - 2 sushi rolls for 35 NIS. Valid for 60 days from date of purchase. Redeem Sun - Thurs, 11 am - 9 pm, Friday, 11 am - 3 pm, and Sat. nights from half an hour after Shabbat until 10:30 pm. Reservations required. Not valid on chol hamoed. Limit one per person per visit. Not valid on menu "specials". Leonardo Club (Eilat) Buffet deals - Breakfast for one, 55 NIS or for 2 - 99 NIS / Lunch for one for 69 NIS or for 2 for 135 NIS. Voucher valid thru Dec. 31, 2019. Redeem any day of the week, reservations required. Breakfast served from 7 - 10 am, lunch served from 1-3pm. Children under 2 do not need a voucher. Breakfast for 2 at News Coffee Bar, Eilat, for 65 nis (64 if you hurry!) (yes, I checked and they are kosher even though Groo doesn't specify). Voucher valid thru May 30, 2019, but not between April 17-27. Redeem Sun - Thurs, 10 am - 5 pm. Limit one deal per couple. Burgers for 2, at Beit HaBasar, Beer Sheva, for half off! Or buy the full dinner for 2, starting at 98 nis (includes salads etc, but entrecote steak is only included in the 159 nis deal). Voucher valid thru April 10, 2019. 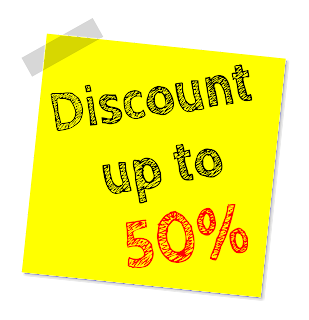 Cannot be combined with other discounts. Redeem Sun - Thurs, noon - 11 pm, and Sat. nights until midnight. Reservations required after 7 pm. Limit one deal per couple. Anyone in your party without a Groo voucher will be required to place a min. 50 shekel order. Max 2 vouchers per table. Larger groups cannot split up into multiple tables, sorry. Lechem Basar (Mehadrin, Beer Sheva) - dinner for 2 for 299 nis. Voucher valid thru Aptil 15, 2019. Redeem Sun - Thurs, 12:30 - 11pm, and Sat. nights, 8-11:30pm. Reservations required. Valid for sit down service only. Limit one voucher per couple. Ashkera (Eilat) - shipudim meal, including unlimited salads, for two for 129 nis. The deal doesn't specify if they are kosher, but I checked in with the establishment and they said they have a Teudah. Voucher valid for 60 days from date of purchase. Redeem Sun - Thurs 11 am - 6 pm, and Fri 11 am - 3 pm. Limit one voucher per couple. Fifth Avenue, Eilat - Dinner for two for over 30% off the regular price! Voucher valid for 60 days from date of purchase. Redeem your voucher on Sun - Thurs, 7 pm - 1 am, and Sat nights from 1 hr after Shabbat ends until 1 am. Be sure to show your voucher to the host/hostess before you are seated. Reservations required. Max 3 couples at a table with vouchers. Breakfast Buffet at the Central Park Hotel, Eilat (I checked, the hotel is kosher, even though Groo doesn't specify) - 59 shekels for 1, or 109 shekels for 2. Valid Sun- Fridays, 7:30 -10:30am. Children under 2 eat free with an adult. Reservations required. Limit one voucher per person or couple. Voucher valid thru June 30, 2019. Ribs in Ashdod - deals starting at 99nis for a 2 person meal! (upgrade that includes wine, dessert, and coffee is available) Voucher valid thru May 29, 2019. Limit 6 people per table if using a voucher. Can be redeemed Sun-Thurs, noon - 7pm. Reservations required. Lunch at "Space" in Moshav Emunim - 139nis for 1 person, 279nis for 2, or 549nis for 4. Voucher valid thru June 29, 2019. Check for blackout dates, and reservations required. Generally valid Sun-Thurs noon - 5:30pm or Fridays noon - 2pm. Anyone in your party without a voucher will be required to order 100nis minimum from the menu, and children under 10 will be required to order a 40nis children's meal. According to the info posted, you can use their gardens (and pool, maybe) before and after your meal. If you didn't find the restaurant you were looking for, be sure to check out additional deals at eLuna - click here for info! Have you joined Israel Deals Made Easy! on Facebook? Join us there and you'll find out about awesome deals every day! You'll want to check out this Groo deal! This deal for a winery tour and tasting in Dalton is good only thru April 12, so hurry! It's an awesome deal for a winery tour with tastings - just 39 NIS for two people. If you want breakfast before your tour, it's a great deal at 149 NIS for 2! Groo deals often sell out quickly, so be sure to order before the deal ends - this one is only going to be around for a few more hours! Kosherfrugal.com and Janglo have teamed up to bring you the best Groo deals and more! Technoda - best deal is the family ticket - 2 adults plus 2 children for 149 NIS. But there are other tix available offering great discounts, as well! Go-Karting and more at Montfort Lake - there are options for just go-karting, or combine it with another activity! Kayaking at Hagoshrim - starts at 64 NIS. There are two kayak routes - one is regular (age 5+), and the other one is the "challenging" one (age 10+). They have different prices for the two packages, so check carefully. There are options to purchase tix for one, two, or four people. Be sure to reserve in advance! Camping packages at Hagoshrim (does not include a tent!) - some packages include kayaking! Be sure to reserve in advance! Jumpark in Rishon - 39 NIS for one person, 77 NIS for 2 people, or 153 NIS for 4! Safed Puzzle Room - get 10% off when you mention "Kosher Frugal" in your reservation request! DeKarina Chocolate Factory - factory tours for 20 NIS. Do a factory tour + chocolate workshop for 52 NIS (children's workshop) or 56 NIS (adult workshop)! Be sure to reserve your visit in advance! I'll be updating this post with more deals as they become available! Also be sure to check out my FB group and ask for deals there! Save on your Book Depository order - use code IL10 to get 10% off your books! It's the perfect time to get a head start ordering your summer reading list! Book Depository ships free worldwide and is extremely reliable! Most people report that their packages arrive with no problems. Do you have to file Israeli taxes? FREE help is available! Every year, many of us have to file a yearly tax report with the Israel Tax Authority. Many, many people pay an accountant to handle this report, but did you know that in some cases you can also get FREE help? The Israel Tax Authority runs Free Clinics for Atzma'im with income from self employment up to 60,000 NIS using Form 137, and other people who need to file a tax report using Form 1301.
sorry about the low quality snapshot! 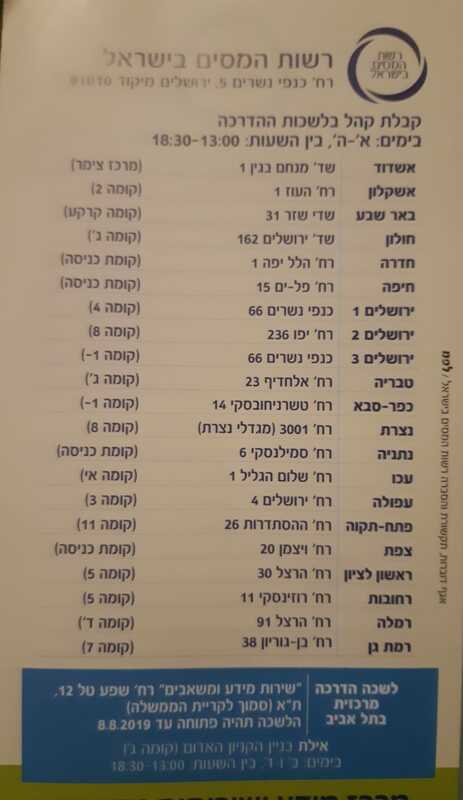 Every Regional Tax Office (except Eilat and Tel Aviv - details below), between May 12, 2019 and July 4, 2019, Sunday - Thursday from 1pm - 6:30pm. Some offices may be closed on certain days of the week. I recommend calling before you go to verify they are open! In Eilat, the clinic will be available only on Mondays and Wednesdays. In Tel Aviv, there is a special Resource Center dedicated just to this service, and it will remain open until August 8, 2019. Find it at Rechov Shefa Tal 12, Tel Aviv. Good luck, and don't wait to do your taxes! Better just to get it done with, right? If you're struggling to stay on top of life because you're not yet earning enough money, be sure to check out my Financial Assistance Series, and see if you may qualify for help you didn't know about! Kosherfrugal.com and Janglo have teamed up to bring you some great GROO deals you don't want to miss! This roundup post includes deals I posted separately, and a whole lot more! Pre-purchase your vouchers and save up to 50%! This is a GREAT way to save when you want to splurge! Don't miss out on the savings - check below for savings in your area! This post focuses exclusively on kosher restaurants and take-out food, so if you're going to splurge, you can now afford to splurge a little more, with discount vouchers and savings. I keep checking for new deals, as I know you've been waiting for some, and I am so excited that there were so many new deals this week - you definitely need to check this list out if you are planning to eat out! Also, be sure to check the Facebook group so you don't miss out on new additions all the time! If you're looking for discount admission tickets, not food, click here! Click here for restaurant deals in the North & South! Olive Oil deal from Meshek Aloni - delivery is not included in the deal. 2 liters for 79 nis, or 4 liters plus a jar of olives for 144 nis. Or this new olive oil deal from Meshek Achiya - 5liters plus 250 mk bonus bottle, for 199 nis plus shipping! NEW! Huge sushi platter deal at Oshi Oshi, Mevasseret - get a huge platter for 199 NIS, or a premium platter for 219 nis! Voucher valid thru June 30, 2019, but not valid April 15-30, or on holidays. Redeem Sun - Thurs, 11 am - 19:30pm, Fridays, 11 am - 2 pm, and Sat. nights from half an hour after Shabbat until 10:30pm. Can be used for takeaway orders. No substitutions to the standard platter. Place your order at least 3 hours in advance. Not valid on delivery orders. Limit one voucher per customer. NEW! Breakfast buffet at the Leonardo Jerusalem for 69 NIS (for 1) or 129 NIS (for 2)! Valid thru April 30, 2019, but not on holidays or chol hamoed. Redeem Sun - Fri, 6:30 - 10 am. Reservations required. Limit one voucher per person/couple. Max. 6 people with vouchers at a table. Babies under 2 do not need a voucher. Dinner for 2 at Montefoire (Yemin Moshe, Jerusalem), for 229 nis (or 259 nis for the premium deal). Voucher valid thru May 31, 2019. Be sure to show your voucher before you order. Cannot be combined with other deals. Redeem Sun - Thurs, 11 am - 8 pm, and Fri, 11 am - 2 pm. Reservations required. Limit one voucher per couple. Max 6 diners at a table. Anyone in your party without a voucher will be required to order a main dish off the menu. Expires soon! Breakfast for 2 for just 59 nis (58 if you catch the early bird deal) at Pesto (Katamon, Jerusalem - mehadrin & badatz)! Voucher valid thru March 31, 2019. Redeem your voucher Sun - Thurs, 9am - 2pm, and Fridays 9am -2pm (reserve in advance for Friday). Limit one voucher per couple per visit. Breakfast starting at 19 nis for a dessert-style breakfast, or 35 nis for one (65 for 2) for a full breakfast off the menu at Cafe Gourmand (at the Shani Hotel) . Voucher valid thru June 30, 2019. Redeem Sun - Thurs, 8am - 2:30pm, and Fri, 8-11am (dessert breakfast ends at 1:30pm Sun- Thurs). Reservations required. Expires soon! Gourmet meal for 2 for 249nis (half off!) at Pichonka in Nes Harim. Reservations required. Voucher must be redeemed by Mar. 31, 2019. Blackout dates apply. Max 5 vouchers per group. You must show the voucher before you order, and anyone in your party without a voucher will be required to place an 100 nis (minimum) order. Expires soon! Eyal Hotel - Breakfast buffet - 59 shekels for 1, or 115 shekels for 2! Valid Sun-Fri, 7:00am - 10:00am. Reservations required. Valid thru March 30, 2019. Workshops (meat cooking/butchery) at Ktzizot - including a "Carnivore's meal" and a glass of wine, for 139nis! Voucher valid for 60 days from date of purchase. Reservations required. Workshops take place on Mon, Tues, and Thurs, at 6pm and last for 2 hrs. Plan to arrive 15 min before your workshop begins! Pescados - (Badatz, Jerusalem) Lunch for two for just 139nis! Or the Dinner deal for 44% off regular price (your choice of party of 2, or party of 4). Vouchers valid for 60 days from date of purchase. Reservations required. Blackout dates apply. Pescados also offers an "Italian Chef's Dinner for 2" deal - Italian meal for 2 for 189 nis (normal price 403 nis)! There's also a less pricey option - choose a meal that normally is priced at 282 nis, for just 155 nis! Voucher valid for 60 days from date of purchase. Reservations required (some blackout dates may apply). Redeem Sun - Thurs, noon - midnight, and Sat nights from when Shabbat ends until midnight.. Limit one voucher per couple, and limit 2 couples with vouchers per table. NEW! 24 hour deal! 99 NIS for dinner for 2 at Paradiso in Sarona! Voucher valid thru April 5, 2019. Redeem Sun - Thurs, 9am - 11pm, and Fri, 9am - 1pm. Reservations required. Cannot be combined with other specials or deals. Max. 3 couples with vouchers per table. Anyone at your table without a voucher is required to make a min. order of 50 NIS. Limit one voucher per person. NEW! Dinner for 2 at Little Naples - Napoli Haktana - in Tel Aviv, for 69 NIS (89 NIS if you want wine included!)! Voucher valid thru April 19, 2019. Cannot be combined with other specials and deals. Redeem Sun-Thurs, noon - 6 pm. Limit one voucher per couple. NEW! Fresh Kitchen, Namal Tel Aviv (mehadrin) - dinner for 2 for 129 (reg. price is 204 NIS for this menu option!) - or the premium option for 169 NIS! Voucher valid thru April 20, 2019. Redeem Sun - Thurs, noon - 10:30pm, or Sat. 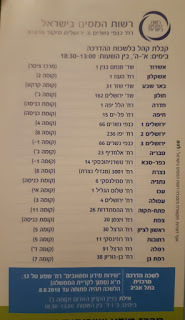 nights from one hour after Shabbat until 10:30pm. One voucher per couple. Max 2 vouchers per table. NEW! Breakfast for 2 at Fresh Kitchen, Namal Tel Aviv (mehadrin). 69 NIS for breakfast Sun - Thursday, or 79 NIS for a Friday deal! Voucher valid thru April 20, 2019. Not valid Election Day. Redeem Sun - Friday, 9am - 12:30pm, Fridays reservations are required. Limit one voucher per customer. Deli Sandwiches at Bis Bis (Rotschild, Tel Aviv) for just 15 nis (reg. price 26 nis). Voucher valid for 60 days from date of purchase. Valid for sit-down service or take out. Redeem your voucher Sun - Thurs, noon - 5 pm. Limit one voucher per person. Get a 50 shekel voucher for just 25 shekels, for your purchase of vegan cheeses from The Nuts Chef! Pick up from their store in Rosh Ha'Ayin or Namal Tel Aviv. Limit one voucher per purchase. Voucher valid for 5 years from date of purchase. Expires soon! Paradiso Cafe in Sarona Market - buy one get one free breakfast deal (79 shekels for breakfast for 2!). Redeem Sun - Thurs, 9am - noon. Voucher valid thru March 29, 2019. Or choose dinner for 2 at Paradiso, for 139 NIS. Voucher valid thru March 29, 2019. Be sure to show your voucher before you order! Redeem Sun - Thurs, 9 am - 11 pm, and Fri, 9 am - 1 pm. Reservations required. Max. 3 vouchers per table. Anyone at your table without a voucher will be required to place an order of min. 50 NIS. Sushi Platters from Tampopo Sushi Bar (Tel Aviv) - 40 pcs. for 99nis, 64 pcs for 169nis, or 96 pcs for 199nis! Voucher valid for 60 days from date of purchase. Order your platter at least 2 hrs in advance of pick up. Delivery is available for an additional charge. Redeem Sun - Thurs, 11:30 am - 11 pm, and Fri, noon - 3 pm. Steak dinner at Kaza (Bat Yam) - 79 nis for 1 person, or 149 nis for 2. Or choose the mixed meat platter for 119 nis for 2 people, or 319 nis for 4 people. Also available: shipudim for 2 for 99 nis, or a fish dinner for 2 for 109 nis. Voucher valid thru April. 30, 2019 (extra 10 shekels payable to the restaurant if you redeem during Pesach). Redeem Sun - Thurs, 5 pm - last customer, and Sat. nights, from 1 hr after Shabbat - last customer. Reservations required. Max. 6 per table when using vouchers. Anyone at your table without a voucher will be required to place a min. order of 75 nis. Soup & Rice at HaTeimani in Tel Aviv, 19 nis for 1, or 35 nis for 2! Voucher valid for 60 days from date of purchase. Redeem Sun - Thurs, 10 am - 4 pm, for seated service or take-out. Limit one voucher per person/couple. Cafe Med at the Hilton (Tel Aviv) - Shabbat meals starting at 255 nis. Voucher valid thru Mar. 23, 2019. Friday night dinner is served 18:30-21:30, Shabbat lunch is served 13:00 - 15:00. Reservations required. Limit one voucher per person. Max 10 per table. Be sure that everyone has a printed voucher. Expires soon! Breakfast Buffet at the Daniel Hotel (Herzliya) - breakfast for one for 69 nis, or for 2 for 135 nis. Voucher valid thru March 15, 2019. Redeem Sun - Thurs, 7-10:30am. Reservations required. Limit one voucher per person/couple. Hagrill Halohet (Tel Aviv - Badatz hechsher) - dinner for 2 for 99 nis (premium package is 165 nis). Voucher valid thru April 30, 2019. Redeem Sun - Thurs, 11am - 2am, and Sat. nights, from one hour after Shabbat until 2 am. Limit one voucher per person. Souvlaki (Netanya) - Greek food for 2 for 219 (reg. price 432 nis). Voucher valid for 60 days from date of purchase. Redeem Sun - Wed, 11am - midnight (last arrival 9pm), Thurs, 11am - 7pm, Fri, 11am - half an hour before Shabbat starts, and Sat. nights, from half an hour after Shabbat until midnight. Max 3 vouchers per table. Reservations required. Anyone at your table without a voucher is required to order a main course off the menu. Sushixi (Rishon) - Asian-style meal for 2 for 79 nis! Voucher valid thru April 30, 2019. Redeem Sun - Thurs, 3 pm - 9:30 pm, and Fri 10 am - 3 pm. Limit one voucher per couple. Or, choose the party platter deal - get an 80 piece platter for 209 nis (regular price 350 nis)! Petrozilia (Tel Aviv) - Lunch vouchers - 69 nis for one person, or 138 nis for 2! Voucher valid for 60 days from date of purchase. Reservations required. Redeem Sun - Thurs, 11:00 am - 5:30 pm. Limit one voucher per person or couple. Resto (Tel Aviv) - Chef's Dinner for two for 229 nis. Voucher valid thru Apr. 16, 2019. Redeem Sun - Thurs, 6 pm - 10:30pm, and Sat. night, from 2 hrs after Shabbat until 10:30 pm. Reservations required. Limit one voucher per couple. Max 3 couples per table with vouchers. Expires soon! Cafe Greg, Givatayim - breakfast for 2 for 79 nis. Voucher valid thru March 30, 2019. Redeem Sun - Thurs, 8 am - 10 pm, and Fri. from 8 am - 2 pm (extra 10 nis per person on Friday, payable to the cafe). Good only at the Givatayim location. Limit one voucher per couple. Hashovach (Tel Aviv) - dinner for 2 for 89 nis, or a premium package for 109 nis! Voucher valid for 90 days from date of purchase. Redeem Sun - Thurs, 11:30 am - 8 pm, and Friday 11:30 am - 3:30 pm. Limit one voucher per person. Pizza Time (Netanya) - personal pie for 15 / family pie for 25 / family pie + large drink for 33. Voucher valid for 60 days from date of purchase. Redeem Sun - Thurs, 2 pm - 8 pm, and Sat. nights from the end of Shabbat - midnight. Friday orders MUST be placed in advance. Toppings and delivery not included. Nusha (Petach Tikvah) - Italian meal for 2, starting at 99 nis. Voucher valid for 60 days from date of purchase. Redeem Sun - Thurs, 8 am - 6 pm, and Fridays 11:30 am - 2 pm. Reservations required. Nusha (Petach Tikvah) - "Toast" or personal pizza with a drink, for 25 nis (48 nis for 2). Voucher valid for 60 days from date of purchase. Redeem Sun - Thurs, 8 am - last customer, or Fridays 8 am - 1:30 pm. Cafe Itamar (Givat Shmuel) - breakfast for 2 for 89 nis. Breakfast is served all day. Voucher is valid for 60 days from date of purchase. Redeem Sun - Thurs, 7:30 am - 11 pm and Sat nights from one hour after Shabbat ends until 11 pm. Limit one voucher per person. Expires soon! Nagisa (Tel Aviv)- Sushi platters starting at 169 nis. Voucher valid thru March 31, 2019. Redeem your voucher Sun - Thurs, noon - 6 pm, Fridays noon - 5 pm, and Sat. nights till midnight. Call in your order for a platter at least 3 hrs in advance. Delivery not included. Expires soon! Lechem Basar, Netanya (mehadrin) - Dinner for 2 for 299 nis. Valid Sun-Thurs, 12:30 pm -11:00 pm. Reservations required. Valid thru March 31, 2019. Blackout dates may apply. Lunch at Tzanani in Bnei Brak (Machpud) - 65 nis for 1, 129 for 2! Valid Sun-Thurs, 11:00 am -6:00 pm. Valid for 60 days from date of purchase. Some blackout dates apply. Breakfast at the David Tower in Netanya, and then use the spa facilities for the rest of the day! 160 NIS for 1 person/319 NIS for two. Reservations required. Voucher valid for 60 days from date of purchase. Must be 16+ to use the spa facilities. Fruit Platters from Ba-Li Pri in Ramat Gan, starting at 99nis. Limit 3 deals per person. Valid for 60 days from date of purchase. Order your platter in advance! Note they have blackout dates. Expires soon! La Place in Netanya - Breakfast for 2, for just 59nis. Limit 2 vouchers per table. Show your voucher before ordering. Use your voucher Sun - Fri, 8:00 am - noon. Valid thru March 31, 2019. Expires soon! Herod's Hotel (Tel Aviv) Breakfast Buffet - 5 star breakfast buffet for 1, for 79 nis, or for 2 for 155 nis! Voucher valid thru March 30, 2019. Redeem your voucher Sun - Thurs 6:30 am - 10:30 am. Not available for Fridays. Reservations required. Limit one voucher per person or couple.